It is much more difficult to criticize a film that is based on a true story, especially when the end of the film is peppered with real-life footage and interviews. 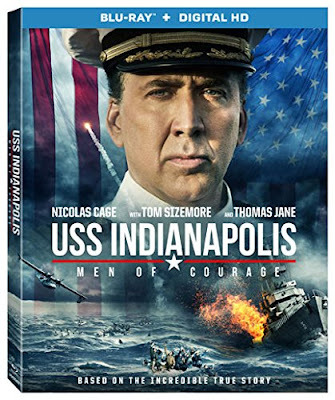 This can make a mediocre film seem better than it is by leaving the audience with its most powerful moments, but even connecting the actors to their real-life counterparts is not enough to save USS Indianapolis: Men of Courage. There is far too much to criticize, including a mouthful of a title, distracting from any ability to create empathy for the real-life men through the characters in the film. The USS Indianapolis was the American navy ship tasked with delivering the atomic bomb that would eventually be dropped on Hiroshima. Because of the top secret mission delivering the nuclear weapon, the USS Indianapolis was given no support or means of defense, leaving them exposed on their journey home. USS Indianapolis: Men of Courage is a lengthy film of 131-minutes, split into three different sections of narrative. The beginning of the film is their journey to complete their task, but the largest portion of the film is reserved for their difficult survival after being attacked by a Japanese submarine on their way back to the Unites States. It turns out that the initial sinking of the ship is far less devastating than the inaction that follows. Though most of the men survive the sinking of the USS Indianapolis, they are left stranded in the middle of the ocean, where they are completely exposed to be picked off by swarms of sharks attracted to the blood of the carnage. This portion of the film has plenty of potential, though it is mostly lost by special effects that are well below sub-par and a screenplay that offers no context or significant character development between the random and often unrealistic shark attacks. Before long it begins to drag under the weight of repetition and bad melodrama, though the film shows no improvement in the final portion of the narrative. Switching directions entirely, the final act of the film feels like it belongs to another movie entirely. Upon arriving back home after a daring rescue from sharks in enemy waters, the film becomes about the criminal charges brought against the ship’s captain, Charles McVay (Nicolas Cage). Though the urge to tell all aspects of the story is understandable, the themes of their survival in the water don’t exactly mesh with the criticism of the government’s swift treatment of the public relations disaster as opposed to the slow rescue efforts for the real devastation. Men of Courage tries to be a patriotic film while simultaneously condemning the American government but never figures out how to do both simultaneously, which often leads to a disjointed narrative. It would be far too easy to nitpick the faults of USS Indianapolis: Men of Courage, pointing out all of the derivative and cliché sub-plots and characters, which include a love story between two sailors and the girl they both love (it didn’t work in Pearl Harbor, and it doesn’t work here). There are little problems scattered throughout the entire film, but I will focus on the large issues instead. The script jumps around without a cohesive theme to connect all of the moving parts, the acting is mostly amateurish save a few name actors who provide glorified cameos, and the special effects look like they belong in a bad horror movie rather than a film honoring the sacrifice of real men. There are many other things wrong with the film, but these three are reason enough to stay away. The Blu-ray release comes with a Digital HD copy of the film, which actually may be the best extra that could be included. If this film is watched on a phone, tablet, or other smaller screen, there is a chance it will be small enough for the special effects to look passable. The only extra on the disc itself is a making-of featurette, though it is rather detailed at over 30-minutes long.